If you are new to my blog, The Story Behind the Art will take you on a little journey into the STORY behind a particular piece of art or collection created by one of my talented friends from around the globe. The stories are posted on the first Wednesday of each month. Robin Pickens and I have known each other for several years now and as soon as I saw her work I was an instant fan. We mainly see each other on social media but sometimes I have the pleasure of seeing her in person and it's always a treat! Thanks for sharing your story Robin! I’m so excited to share my new project with you because it’s been a really fun journey that has been a long time in the making in some ways yet also an unexpected twist of direction! My story is not just about one design but more about my path to a particular type of work. I have a new fabric line with Moda fabrics that is shipping to stores in November. 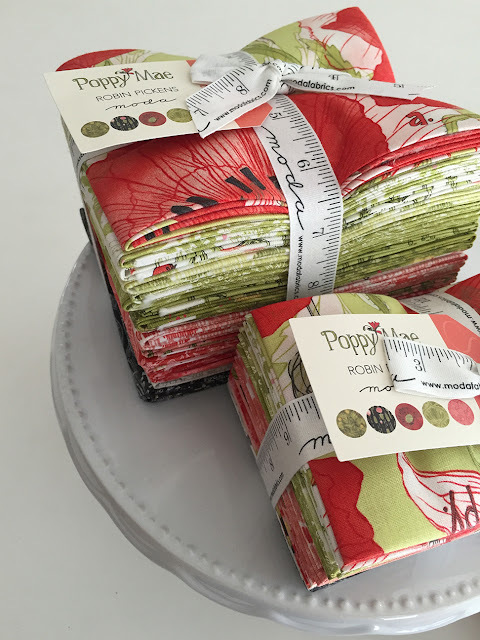 It is called “Poppy Mae” and I also have designed quilt patterns that use this fabric (or you can use any other fabrics with the patterns too). I was so honored last year to be the Fabric8 winner on spoonflower.com, which Moda was sponsoring and offering a contract to produce the line. They were a company I aspired to work with and they have been just wonderful! I grew up in a house with a lot of creativity. My father was an automotive designer and my mother did silk screening, knitting, sewing, quilting, and all kinds of creative projects. I learned to sew at her Pfaff sewing machine which was a rather intimidating machine with some burned out middle speeds and a knee pedal, so it went from slow to super fast with my inexperienced touch! When I went to the University of Michigan School of Art I studied graphic design and industrial design. I was also interested in fiber art and textile design but the fiber art class I took was more geared towards weaving and fabric dying vs pattern design so I stayed focused on my other design directions. I ended up working in the television industry as a broadcast designer and animator for many years. With so much time at a monitor and computer (and I do love designing on my Mac!) I found it was really nice to spend time outside of work on more tactile things, using my hands to make something. My mother and sister were both making quilts at that time and they really had an appreciation for modern quilts. Visiting fabric stores was high on the list of activities that had to be fit in when traveling and I loved the fantastically beautiful fabrics and started building a nice stash. I attended quilt shows with them when possible and of course bought more fabric! My mother was visiting one time after I had moved to LA and we decided to take a quilt workshop together at the Quilters Studio in Newbury Park, California. I decided to draw on some of my solid fabrics with a sharpie to make the types of patterns I wanted for the project. That’s when it started clicking with me…the thought of being a fabric designer. I started taking classes at Otis College of Art and Design in LA in textile and surface design. I loved it! I also started licensing my drawings and designs at this time for other products. 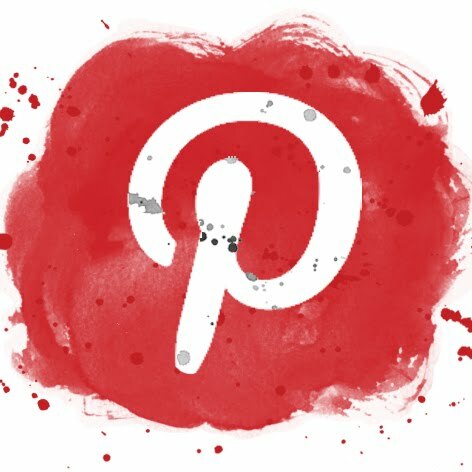 A number of friends recommended I check out spoonflower.com for offering fabric designs in a print-on-demand structure. Spoonflower has weekly competitions with design themes and I started entering them. Soon it was one of my favorite activities of the week to work on some of the funky and eclectic themes for the competitions. 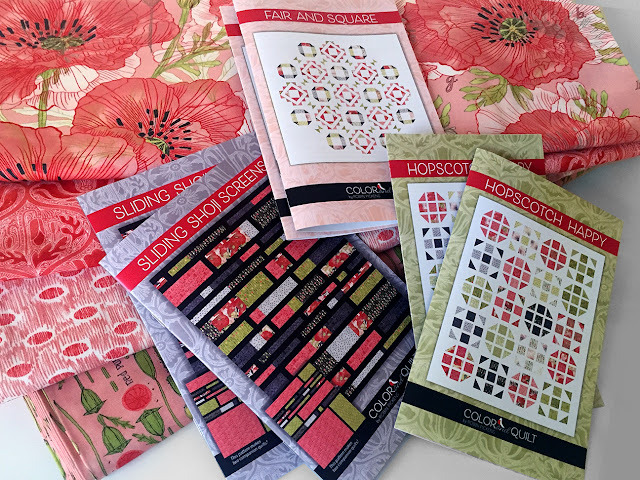 Annually spoonflower has a Fabric8 competition with a fabric company as a sponsor and I jumped in when it was the Botanical Sketchbook theme. I chose poppies because my mom has talked about going to see the poppies in California and she is the one who influenced me originally with sewing. I was very honored to win the competition and decided to go to Quilt Market last October to meet with Moda and check out the show. 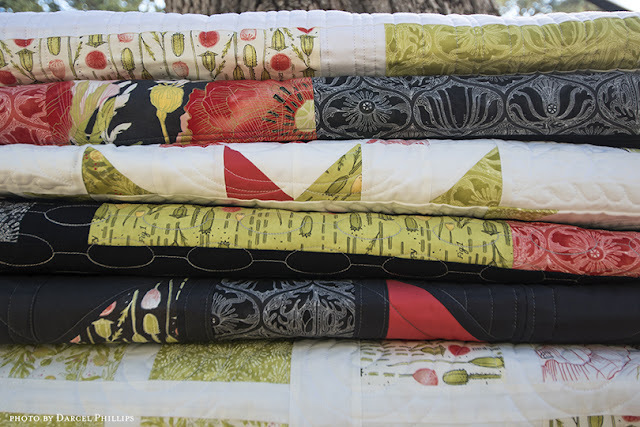 At market I met a number of other designers for Moda who also design quilts and make quilt patterns. This was not anything I had thought of doing before but suddenly I found myself on the airplane making sketches of quilt ideas and head buzzing with a new direction. 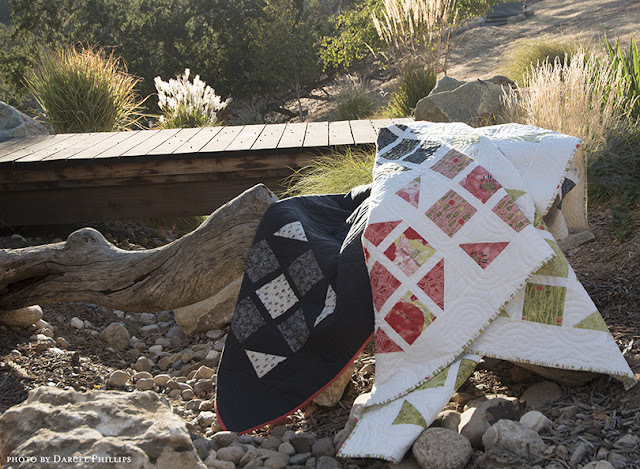 I’ve taken numerous classes and workshops on quilting, often in more improvisational ways. Traditional patterns are not something I’ve tackled before. But I love a challenge and learning new things and I have two of my very own experts- my mom and my sister- to ask for advice. I attended QuiltCon in Pasadena and joined my local Modern Quilt Guilds. Some days my head is so full from all the new information that I think I’m crazy to do this. But I just keep designing and cutting and sewing and trusting in it. I work in both EQ7 (Electric Quilt 7) and Adobe Illustrator for designing quilts. 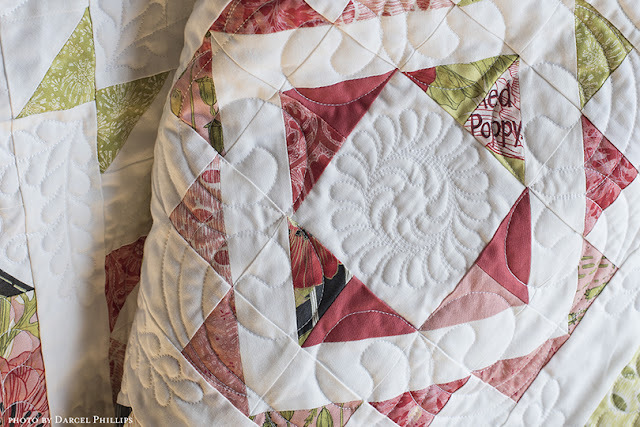 I designed three different quilt patterns to launch with my Poppy Mae line and just last week I sent off patterns to my distributor, United Notions. I wanted a range of quilts that were easy and could be pieced in a weekend to more complex and detailed. I just finished 6 quilts that are samples I will take to Quilt Market in October to show my patterns. I have learned about getting barcodes, writing and printing patterns, hang bags, making samples, ease and difficulty of different patterns, techniques for faster piecing, types of rulers and templates to make cutting certain shapes easier, the tools I like to use, finding long-arm quilters to work with and photographing quilts. My sister has looked over my patterns and been my editor and math re-checker (thank you Wendy!). 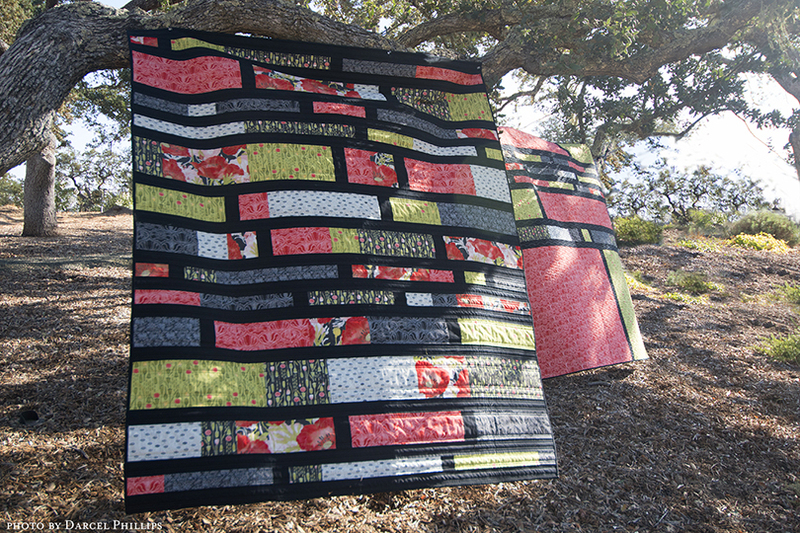 My friend Darcel has opened her home to me and photographed my quilts in her beautiful setting. My husband has helped fill pattern orders. My mother has offered her advice and been a huge cheerleader for me. 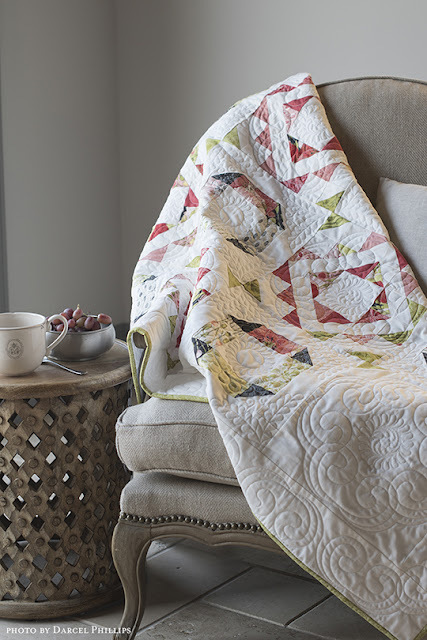 I have such a sense of pride at creating quilts which also stand for upholding a family legacy and tradition. It has made this work feel deeply personal for me. Writing pattern instructions also has the feeling of teaching with it and I like to think through the logical steps. 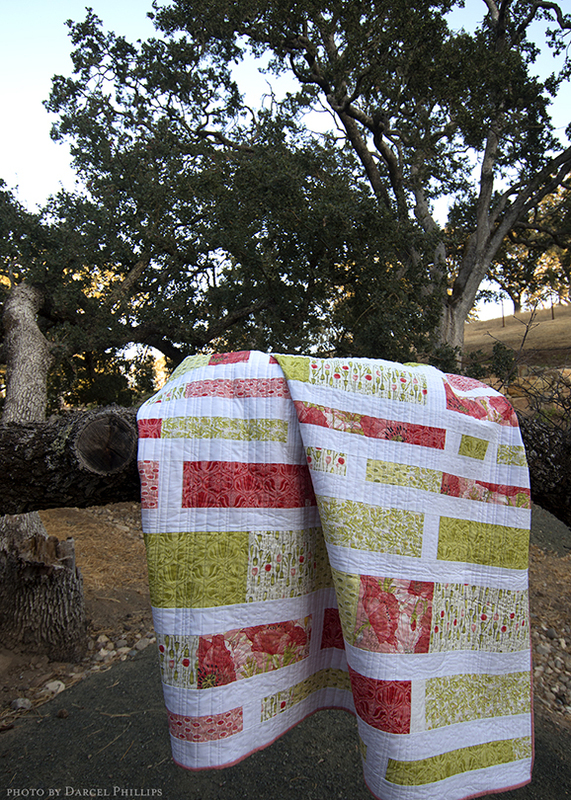 Working on quilts is fun because of the infinite possibilities due to color combinations and pattern placements. I never expected to enjoy this so much! I have more ideas in my head than hours of the day. Enjoying the world of quilt-making has been a surprise, yet natural direction too. My other work includes my calendar line, Seize the Day, for Sellers Publishing. I am currently working on my 7th year of calendars for them). I also create coloring books for Fox Chapel Publishing/Design Originals and I’m working on some inspirational faith-based books now. I have a new coloring calendar from Plan-Ahead out in Walmart where I am featured with Jane Maday, Debra Valencia and Nancy Archer. And now I’m working on my next line for Moda and thinking of new quilts for that. My studio space has become more and more about coloring and sewing than I ever imagined. That is a really happy place to be! 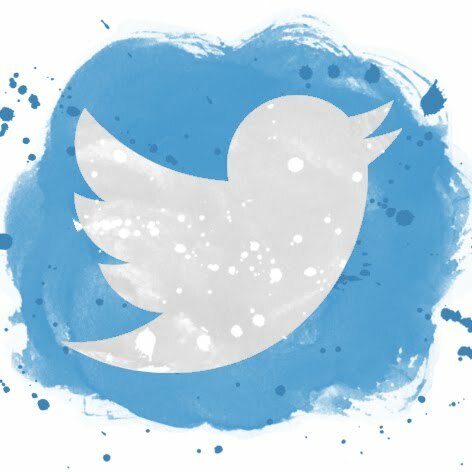 You can find out more about Robin and her work by following these links.